Jule of the Orient® is an energizing blend of Jiaogulan (jee-ow-goo-lahn) — known in China as the “Immortality Herb” — and 21 carefully selected, health-promoting supernutrients from around the world. Jule gives you the adaptogens, phytonutrients, and antioxidants that you need to live life to the fullest! Features a jiaogulan blend, providing a high level of bioactive gypenoside saponins along with the entire spectrum of health-promoting nutrients from the freeze-dried whole herb and juice pressed from the leaf, stem, and root. Ingredients: Reconstituted blend of jiaogulan (Gynostemma pentaphyllum) from standardized high gypenoside saponin plant extract, freeze-dried whole herb and juice from leaf, stem and root; standardized extracts of whole Lycium barbarum fruit, açai fruit, Japanese sophora bud, amalaki fruit, aronia fruit, astragalus root, camu-camu fruit, codonopsis root, elderberry fruit, ginger root, jujube fruit, longan fruit, luo han guo fruit, pomegranate fruit, rhodiola root, schisandra fruit and bilberry fruit; blueberry juice, lychee fruit juice, cranberry juice and cherry juice concentrate, in a base of organic cane juice with natural flavors, malic acid (fruit acid to balance pH), and less than 1/10th of 1% sodium benzoate and potassium sorbate added to maintain freshness. Recommended Use: Drink 1 to 2 ounces twice daily. 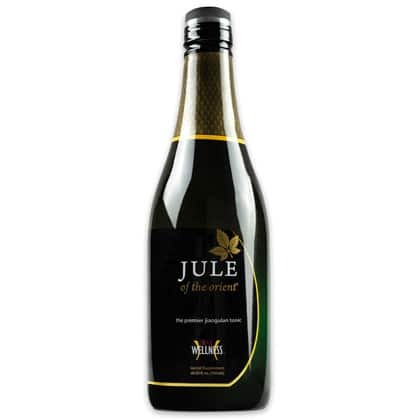 If desired, Jule can be mixed with water or the beverage of your choice. Contains no artificial colors, flavors, or sweeteners.